Apple’s online store was down earlier this morning. Many speculated that it was probably because the company was making preparations to launch new products. It turns out that these speculations were true as Apple has quietly announced a new iPad Air and iPad mini. New iPads – what’s special about them? On Thursday, Apple announced an update to its iPad line with a new 10.5-inch iPad Air and improved iPad mini. The new iPad Air features a thinner design, the A12 Bionic chip and a 10.5-inch display. Further, the new iPad mini retains the same 7.9-inch screen size but gets the A12 chip. Both the new devices support the first-generation Apple Pencil and keyboard as well. Additionally, both new iPads feature a laminated display to improve visibility. Both the models also get a camera boost, offering better low-light performance and advanced sensors for better augmented reality results. As always, the new devices are available in WiFi-only and WiFi + cellular SKUs. The new iPad Air starts at $499, while the iPad mini starts at $399. Both the new devices can now be ordered from Apple.com and will hit the shelves next week. “Today the iPad family takes two big leaps forward with an all-new 10.5-inch iPad Air that brings high-end size, features and performance at a breakthrough price, and a major upgrade to the 7.9-inch iPad mini…,” Phil Schiller, Apple’s senior vice president of Worldwide Marketing said in a press release. After the addition of these two models, Apple’s iPad lineup now includes the 10.5-inch iPad Air, 9.7-inch iPad, 11-inch and 12.9-inch iPad Pro. 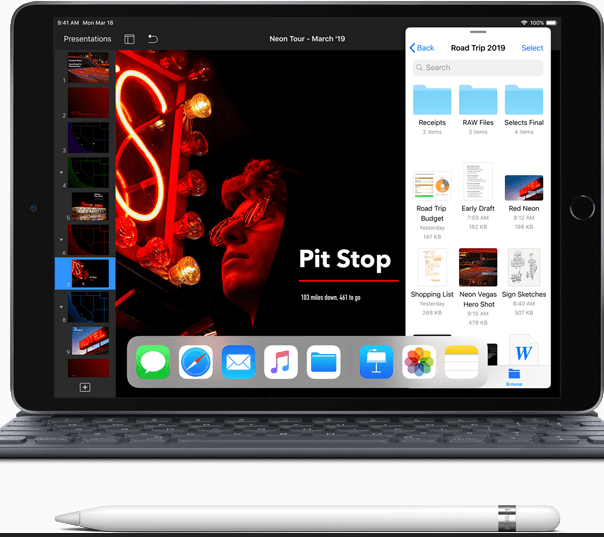 Apple no longer sells the iPad Pro 10.5-inch and iPad mini 4. What’s new with the new iPad Air? Apple’s new iPad Air gets a fully laminated True Tone display with 2224×1668 resolution. This new device appears to be a true successor of the 10.5-inch iPad Pro, which the company does not sell anymore. “…the advanced Retina display with True Tone technology is nearly 20 percent larger with over half a million more pixels,” Apple says in a press release. However, the new device does not feature a ProMotion 120Hz refresh rate display or a quad speaker array that was there in the 10.5-inch iPad Pro. Also, though it gets a performance improvement with the A12, it is no match to the A12x powering the iPad Pro. It still features a headphone jack, Lightning and a Touch ID home button. Additionally, support for the Apple Pencil and Smart Keyboard does bring iPad-like productivity use cases to the Air. Thanks to Apple’s A12 Bionic chip, the 10.5-inch iPad Air gets a 70% performance boost when compared to its predecessor. It is a much-needed performance boost considering a 20% larger display. Apple’s new iPad Air is thinner and lighter than the $329 iPad. The new device weighs just 456 grams and is 6.1mm thick, compared to 469 grams and 7.5mm for the entry-level iPad. It is available in two options, 64GB or 256GB, and three colors – gold, silver and space gray. The WiFi model starts at $499, while the WiFi + Cellular model costs $629. There is, however, not much to talk about except for the A12 chip and support for the Apple Pencil. The new iPad model is the tiniest model from the company to support the Apple Pencil. The display is the same as before, but is 25% brighter than before. “With the A12 Bionic chip, the new iPad mini is a powerful multi-tasking machine, delivering three times the performance and nine times faster graphics,” Apple says. Talking of the price, the WiFi model starts at $399, while the cellular variant costs $529. The new iPad mini also comes in 64GB and 256GB options, and in silver, space gray and gold colors. Apple choosing to release the new iPads quietly indicates that its upcoming press event in Cupertino on March 25 would be all about services. Apple has long been expected to come up with a streaming video and news service. An event focusing only on the service may sound unusual, but is not an unexpected one. For a while now, Apple’s services business is seen as one of its major growth drivers. Now, it appears, services are a top priority for the company, which is witnessing slowing iPhone sales.